Intended for incipient designers, Gratis Knits will be a platform for knitters to submit original and unpublished patterns (featuring a yarns and products available for sale at Knit Purl). A selected pattern will be featured in the next season’s newsletter and the designer will receive a $50 gift card to the store. The deadline for the Spring 2008 Newsletter will be March 1, 2008. 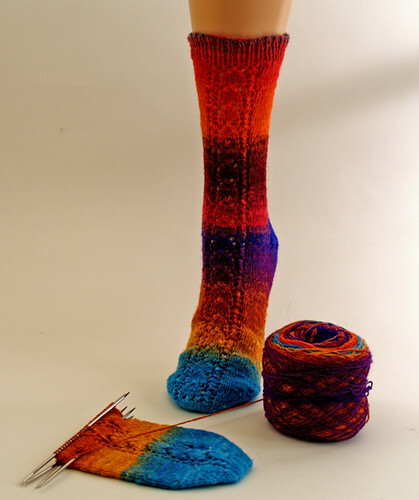 Please submit patterns to info (AT) knit-purl (DOT) com. This sock is knit from the toe-up. Using Turkish CO method; CO 22 sts over 2 DPNS (11 sts per needle) and knit one round. Redistribute stitches as follows: 5 sts on N1, 6 on N2, 5 on N3, and 6 on N4. K1, YO, K2, PM, work ‘Row 7’ of Snowdrop Lace insert, PM, K2, YO, K2, YO, K15, YO, K1. On all even rows to follow: *K1, K1 tbl, K to last 2 sts on instep/ sole, K1 tbl, K1* twice. After this row start with Row 1 of Snowdrop Lace insert between the stitch markers. Continue increasing the toe while working the Snowdrop Lace insert between stitch markers, until there are 50 (54, 58, 62, 66) stitches TOTAL. Work the stitches as established: K7 (8, 9, 10, 11), SM, work Snowdrop Lace insert, SM, K to end of round. 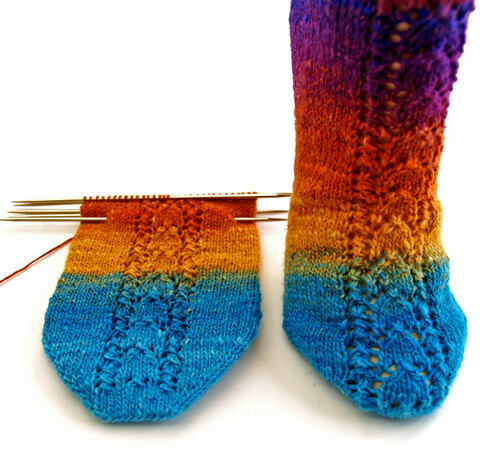 Continue in this manner until sock measures 2” less than total foot length OR 7 (7.25, 7.5, 7.75, 8)” from the CO edge. End with an even row. Row 4: P to next unwrapped st, W&T. Continue in this manner until all stitches and their wraps have been worked. End with a WS row. Turn. K across 25 (27, 29, 31, 33) heel sts. New row starts here. K7 (8, 9, 10, 11), SM, work Snowdrop Lace insert, SM, K to end of round. Continue in this manner until piece measures approximately 9 (8.75, 8.5, 8.25, 8)” from the base of the heel. By this point the second repeat of the colorway should be close. Rows 1 – 12: *K1, P1* across. BO loosely. Work second sock as for first, starting it at the same point in the color repeats as the first if desired. Weave in ends and block. The post Gratis Knits: Winter 2008 appeared first on Knit Purl Blog.